Good Luck Heart – French chart for counted cross stitch. This listing is for the chart and instructions only and does not include any materials. Model can be stitched using linen, evenweave or Aida. Charted for 5 colours of DMC stranded cotton. Chart and Instructions are in French but an English translation is available on request. Snowflake Heart 1 - Cross Stitch Chart by French Designer uses 7 colours of DMC thread or monochrome. Heart shape cross stitch. Geometric. 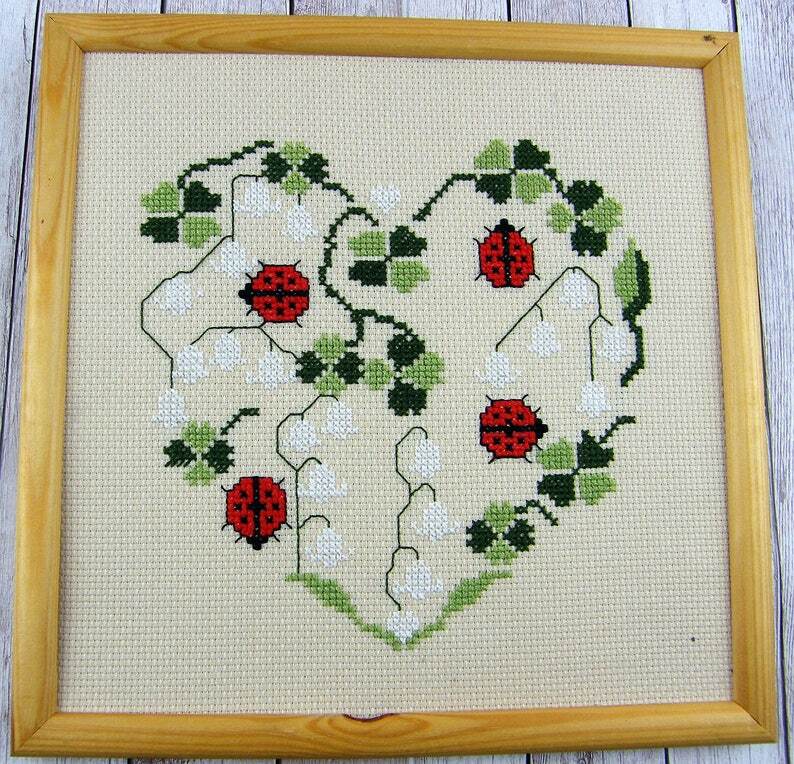 Pretty Floral Heart - Cross Stitch Chart by French Designer uses 6 colours of DMC thread. Heart shape cross stitch. Flowers and Hearts. Patchwork Heart VIII - Cross Stitch Chart by French Designer 6 colours DMC used. Heart shape cross stitch. Geometric. Patchwork motifs. Patchwork Heart IV - Cross Stitch Chart by French Designer in monochrome. Heart shape cross stitch. Geometric. Patchwork motifs. Grenadine Heart - Cross Stitch Chart by French Designer uses 1 colour of hand dyed thread and Mill Hill Beads. Beautiful Pink Heart. Violets Sampler- Cross Stitch Chart by French Designer. ABC sampler with violets, heart, house and bird motifs. Welcome to London – counted cross stitch chart by French designer. To work in 7 colours of DMC threads. London Sampler. London motifs. Printemps (Spring) - Cross Stitch Chart by Spanish Designer. Modern design with stylised house and spring motifs. Modern Cross Stitch. Automne (Autumn) - Cross Stitch Chart by Spanish Designer. Modern design with stylised house and autumn motifs. Modern Cross Stitch.